The Grand Slam 5 can throw balls throughout the entire spectrum of the court with customizable speed, spin, trajectory and oscillation. This unique system enables the machine to simulate true match play to let you work on your style in realistic conditions. 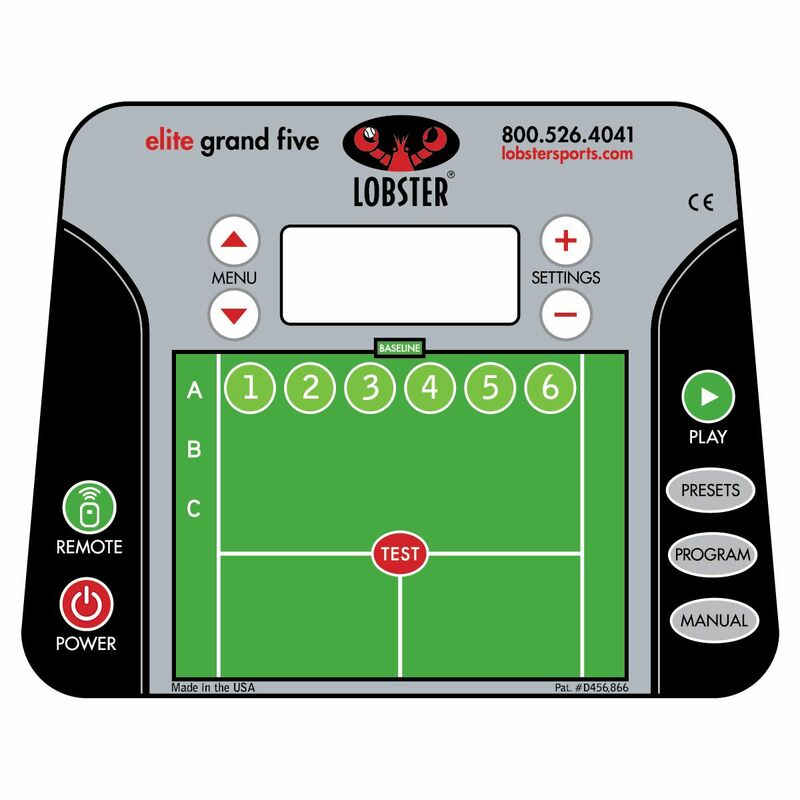 The Lobster Elite Grand Slam 5 ball machine has three positional settings: narrow, medium and wide, which enable you to groove your forehand and backhand ground strokes or warm up your shots. Attack/Defend – a sequence of slow and fast balls to either forehand or backhand, of variable depth. Repeated after a 6-second delay. Forehand Plus – a similar sequence to the Approach mode, with 2 balls on the backhand side to be hit with a forehand. Repeated after a 6-second delay. The handle, which enables you to easily pull and push the machine, is 3ft. (91cm) long and secured by two removable pins: take them out to make the machine more compact when you want to transport it. The oversized 8” (20cm) wheels make it easy to move the equipment over any surface. There is also a court placement indicator, which allows full corner-to-corner sweep, and an elevation indicator, which provides a clear view of the shot height. The machine has moulded handholds on its underside to facilitate lifting it; they have non-slip pads for added safety. for submitting product information about Lobster Elite Grand Slam 5 Ball Machine We aim to answer all questions within 2-3 days. 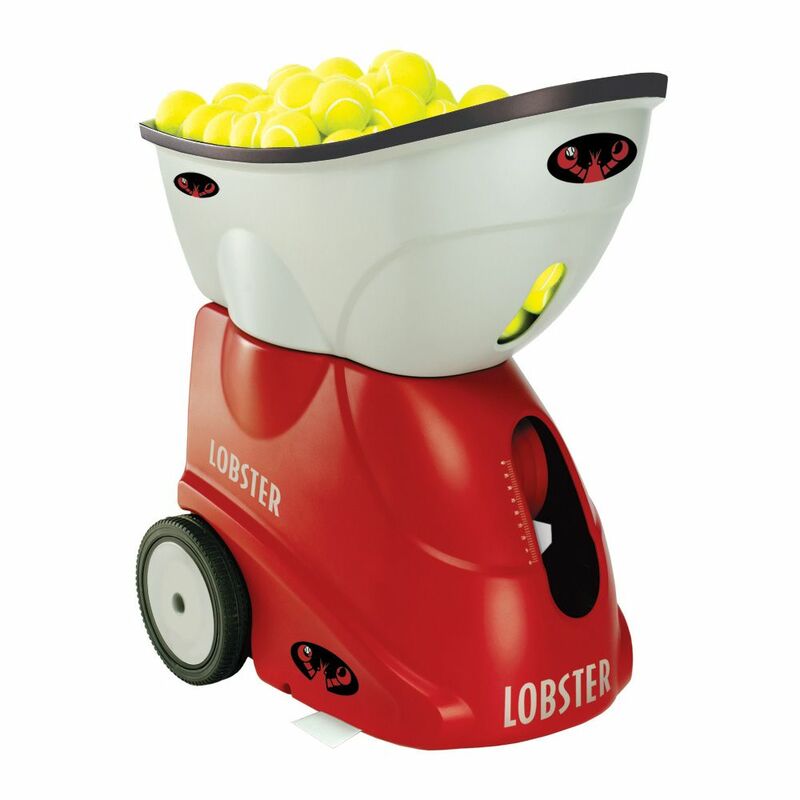 for submitting product information about Lobster Elite Grand Slam 5 Ball Machine. We aim to answer all questions within 2-3 days. If you provided your name and email address, we will email you as soon as the answer is published. for submitting product review about Lobster Elite Grand Slam 5 Ball Machine.